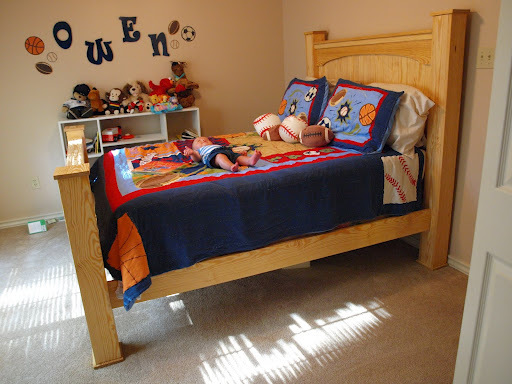 A couple of weeks ago, Chris announced to me on a Thursday night that he was going to make Owen a bed the next day. I’ve learned to just say “ok” and let him get out in the garage and do his thing. I really didn’t pay much attention to what he was doing out there until he asked me to help him put it together. The scale of this picture is off and it makes the bed look bigger than it is. He actually lowered it 4 inches after he got it into his room and I took these pictures. 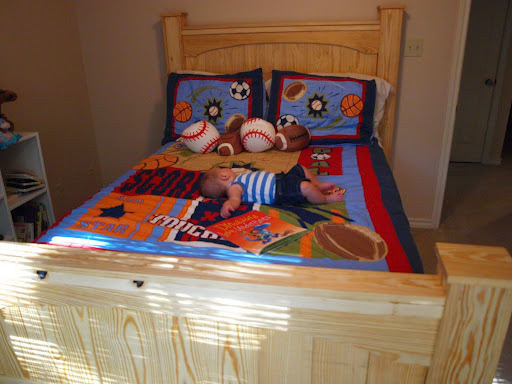 I’m pretty impressed with his work and Owen is VERY proud of his new bed. He loves doing work like this and does a lot of work after school, weekends, and school breaks for different people. He’s definitely happiest when he’s building something….or doing demo!